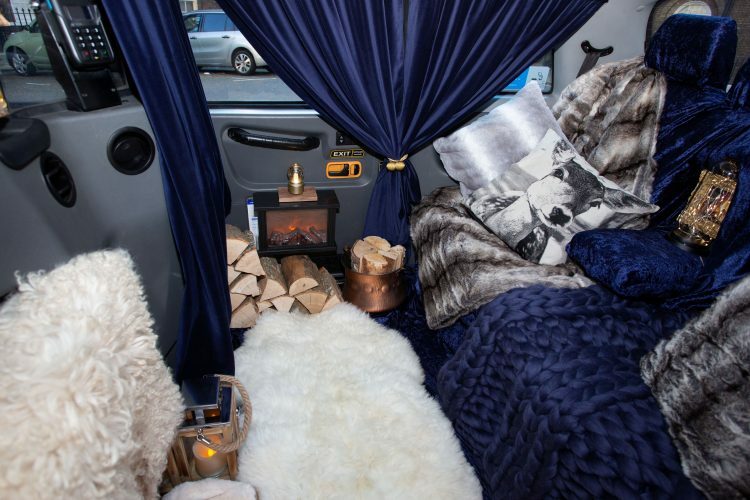 The world’s cosiest taxi has been unveiled in London featuring velvet seats, sheepskin rugs – and a roaring FIREPLACE. From the inside, it’s almost unrecognisable as a London black cab, with blue velvet curtains hanging on the windows and screen divider. And an imitation fireplace has been mounted to the passenger door – accompanied by a stack of logs to complete the effect. The mobile log cabin is currently being trialled, will be taking Londoners to work for free, picking up lucky cab-hailers from all across the city. Sian Lewis, marketing manager for UK boiler manufacturer Baxi, said: “This winter has seen some really chilly mornings, and even as we head towards March it doesn’t seem to be improving. Other decorative touches in the cab include a stag’s head mounted on the centre head rest to create a real ‘country cabin’ feel. Wooden lanterns give soft light from the floor and the cab’s walls, and sumptuous cushions cover the seats and floor, along with luxurious wool throws. 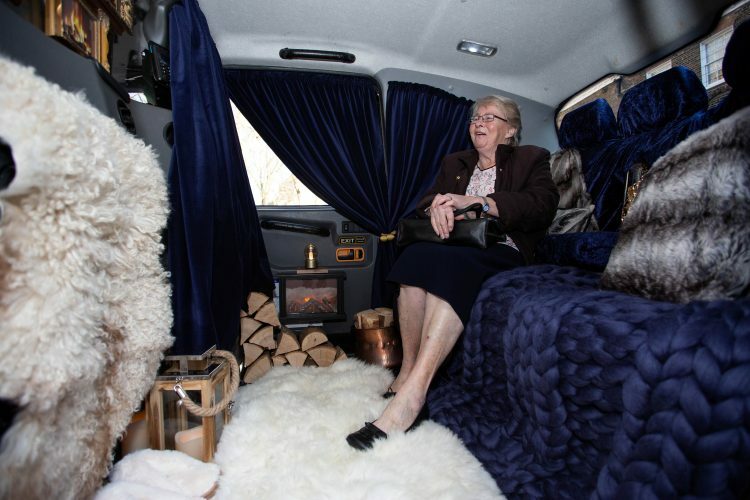 To complete the experience, passengers in the cab will even be given a pair of sheepskin slippers to give their feet the best possible start to the day. 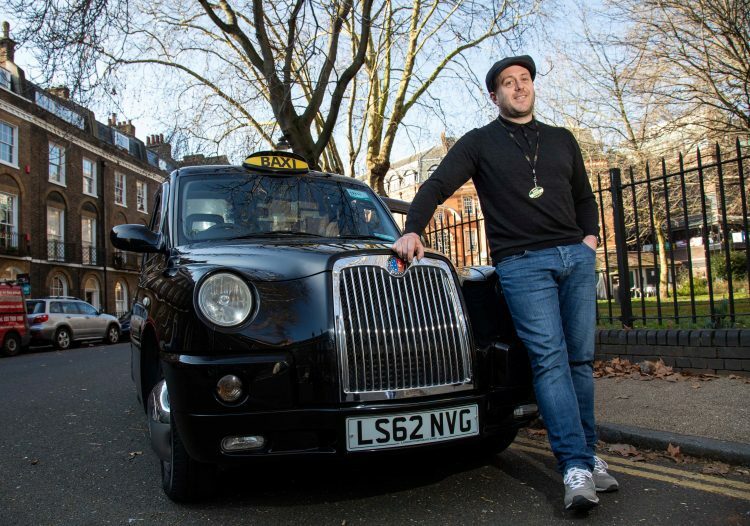 Following its London debut, the cab will be travelling up and down the country offering free lifts in cities across the UK including Birmingham, Manchester and Nottingham. Ahead of its launch, some lucky passersby were given the chance to try the Baxi Taxi out. Linda Joubert, 33, said: “’It was so nice. They had slippers! I’ve never taken my shoes off in a taxi before. To book a free ride, passengers need to Tweet @Baxi_Taxi with their postcode and preferred pick up time. 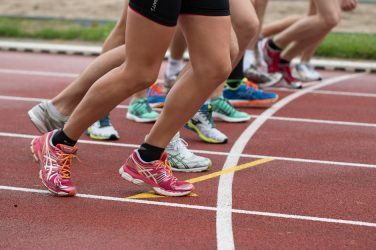 Sian Lewis from Baxi, added: “Getting a cab rather than walking or taking public transport can often feel like an unnecessary luxury. “But because ours won’t cost a penny, it means commuters can ride in absolute comfort, totally guilt-free. The Baxi Taxi will be appearing in towns and cities across the UK from Monday 25 February. Bookings will be available between 10am and 2pm and will be offered on a first-come-first-serve basis.